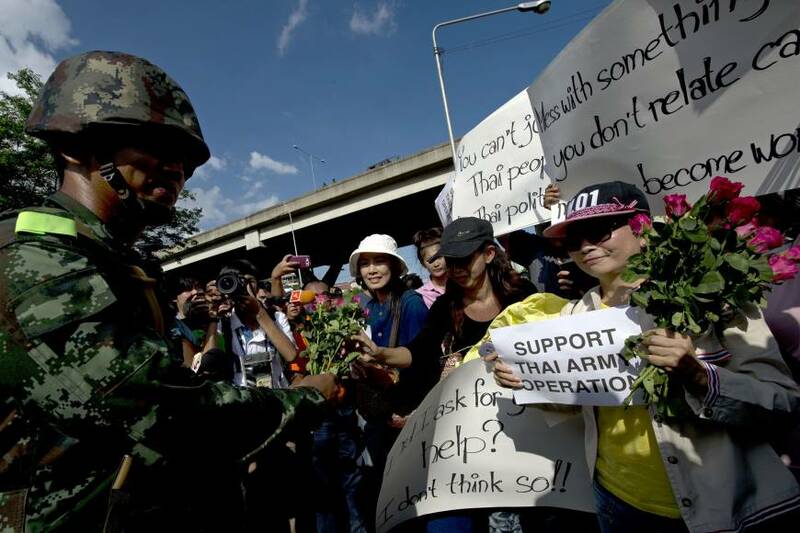 BANGKOK - When Thailand’s army last ousted a government linked to Thaksin Shinawatra, in 2006, his rural-based supporters lacked the organization to mount a resistance. They are better prepared this time. The Red Shirts, who coalesced in 2008 to fight Thaksin’s opponents, have built networks in northern Thailand that mobilized supporters across the nation and helped secure a majority for his allies in a 2011 vote. Their leaders were arrested Thursday, when six months of instability came to a head with the televised announcement by army chief Gen. Prayuth Chan-ocha that he was suspending the constitution in the 12th coup in eight decades. The coup exacerbates divisions between a rural majority that has propelled Thaksin-backed parties to power in the past five elections and their royalist opponents who have used the military and the courts to oust the government. While Prayuth said the army aimed to restore peace in a “short time,” the seizing of power threatens to further undermine an economy that will probably have the slowest growth among its major Southeast Asian peers this year. Two days after declaring martial law and saying there was no coup, Prayuth on Thursday announced he was seizing control to restore peace. Sitting with top military officials, he said there is a nationwide curfew nightly and political protests are banned. The coup could provide short-term certainty to markets after months of protests and upheaval that led to the removal on May 7 of caretaker Prime Minister Yingluck Shinawatra — Thaksin’s sister — by the Constitutional Court.Still, the coup comes days after the state planning agency reported gross domestic product shrank 0.6 percent in the three months through March from a year earlier. Moody’s Analytics was forecasting the economy to grow 0.2 percent this year but says it may now suffer a recession, which would be a woeful performance compared with 6.5 percent growth in 2012. Among developing countries, Thailand is in the top tier for incomes and standard of living, a position that puts developed status within reach if growth isn’t stymied by political upheaval. It is the sixth-largest economy in Asia, with GDP of about $366 billion and is significant to the world as a food exporter, tourism destination, and manufacturer of cars and computer hard drives. Tourism employs millions and directly contributes about 6 percent of GDP. 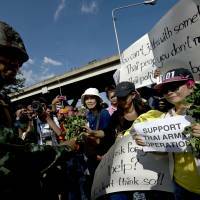 For January to March, tourists dropped 6 percent to 6.6 million as headlines overseas about protests and violence in Bangkok muddied the welcome mat. “We are now offering discount prices to attract customers that may have a little worry about the situation there,” said Chen Jiying, saleswoman at Beijing Youth Tourist Service. Still, the strong appeal of Thailand’s pristine beaches, famous food and vibrant culture along with savvy marketing has consistently lured visitors. The intervention by the army to oust Thaksin in September 2006 and install Gen. Surayud Chulanont as interim prime minister saw the military enmeshed in the political sphere for more than a year. It wasn’t until December 2007 that an election was held, in which a Thaksin-allied party won the most parliamentary seats. Since the 2006 coup, courts have disbanded two parties tied to Thaksin and disqualified three prime ministers backed by his allies. Thaksin has lived overseas since fleeing a prison sentence in 2008 on corruption charges stemming from a military-appointed panel after the coup. Thai instability stretches back decades, with more than 20 prime ministers since 1946. Until Thaksin’s term from 2001 to 2005, no prime minister had ever served a full term. Turmoil has worsened since 2006 as the nation has divided into two camps: red and yellow. The Yellow Shirts comprise Bangkok’s middle class, royalists and retired generals. They have called for several versions of an appointed government in the past few months and are aligned with the opposition Democrats, who have not won a national vote since 1992 and boycotted a February poll. Thailand is a constitutional monarchy. King Bhumibol Adulyadej, 86, has reigned since 1946. The Red Shirts point to the coup and subsequent court rulings that dissolved parties allied with Thaksin as proof that Thai society is unjust and filled with double standards. They took to the streets in both 2009 and 2010, calling for new elections. The protests in 2010 were put down by the military, resulting in more than 90 deaths. Prayuth said he aimed to reform the political sphere, the economy and society, but gave no details. The anti-Thaksin movement had pushed for the formation of an appointed council to replace governments linked to the former premier. Thailand had a fully elected Senate for nine years under its 1997 constitution. The current charter, written in 2007 by a military-appointed assembly, calls for just over half of the members to be directly elected, with the rest appointed by a commission.